Learn more about campaigns and projects aimed at promoting good jobs, fair wages and higher minimum wages across Canada. ACORN members will continue to be key leaders in the fight back to make sure Ontario is an affordable, livable province for low and moderate income people. Despite some positive initiatives, ACORN members are deeply disappointed by the lack of action put forward in the Poverty Reduction Strategy. Tomorrow, September 15, ACORN members in Ottawa and across the country will join the Public Service Alliance of Canada (PSAC) to send a clear message to the Harper government: your cut backs will affect us all. Thousands of government workers are being fired right now. Not only do our communities need good, well-paid jobs, we need badly need the services those workers provide. Cuts to food safety programs, cuts to programs for seniors, cuts to services that put unemployed Canadians back to work - these will affect us all. To find out more about the work that PSAC does, visit their website. 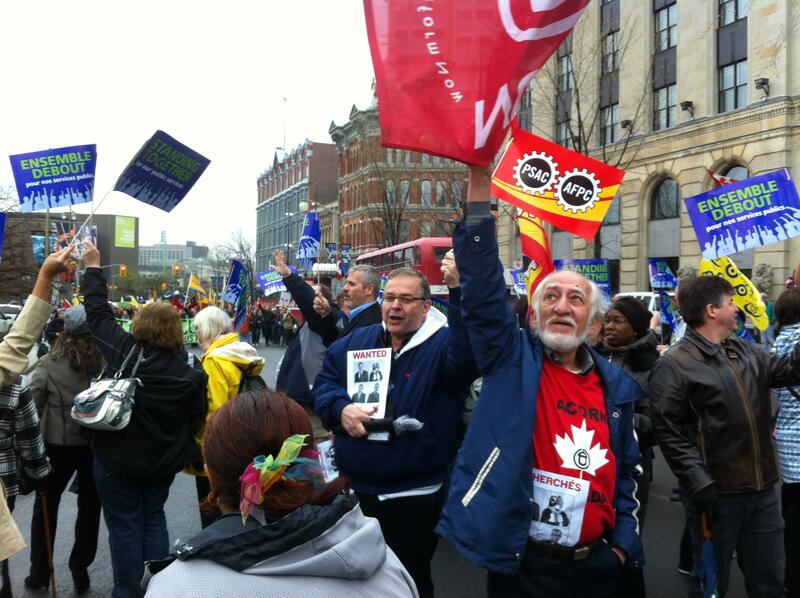 If you can join ACORN members when they rally with the PSAC, contact the ACORN office nearest you. Government also reduces planned hike to child benefits as it tackles deficit. The provincial government is scaling back a planned hike in child benefits and freezing social assistance, Premier Dalton McGuinty said Sunday, as Ontario grapples with a solution to its $16-billion deficit. Rather than rising by $200 per year in July 2013, the child benefit will rise by $100. It will increase by the same amount one year later. Provincial social assistance programs - which include Ontario Works and the Ontario Disability Support Program - will be frozen. "We believe these are the right choices," McGuinty told reporters in Toronto. The announcement comes just days before the government's seminal March 27th budget containing McGuinty's response to a growing financial crisis in the province. With speculation rising that the City of Toronto may try to pull the plug on the Occupy Toronto movement's stay in St. James Park, those in the camp remain steadfast in their determination to draw attention to financial inequalities between society's haves and have-nots. Despite rain and cold, the downtown park remains packed with dozens of tents, and spirits remain high among those staking out the space as the protest nears the one-month mark. Even rumblings that Mayor Rob Ford has intimated that the occupiers should move on have not dampened the protesters' resolve. "They've had a peaceful protests but I think it's time we ask them to leave," Ford said during a news conference held to discuss the Eglinton LRT Wednesday morning, "Again I have to confirm this with the chief and I'm not here to speak on the chief's behalf ... I think everyone can appreciate it's been a peaceful protest but I think it's time that we ask them to move on." Ford's statements were backed by non-specific comments by city manager Joe Pennechetti that the City was looking into "appropriate steps" to deal with the site.